Julie Zhuo started working at Facebook almost eight years ago at age 22. At the time, she didn't know what she'd be working on, or where the company was going. But she liked its energy, the way everyone hacked forward, together. Today, as Director of Product Design, she feels like she was able to grow up with the organization — and as a result, shape several of the processes that have made Facebook unique. One of these defining processes is hiring some of the best design talent in the world to think through the complex and often delicate interactions people have online. And Zhuo has seen both sides of the coin: How to hire designers for a mature corporation, and what to look for at the very beginning. “At a startup, you need your first one or two designers to be versatile — great jacks-of-all-trades," she says. "Not only do they need to deeply understand and think through product strategy, they also need to have good interaction chops and decent visual sense, since they’ll be doing everything from designing the UX to thinking about the brand to designing icons — they need to have a diverse skill set." 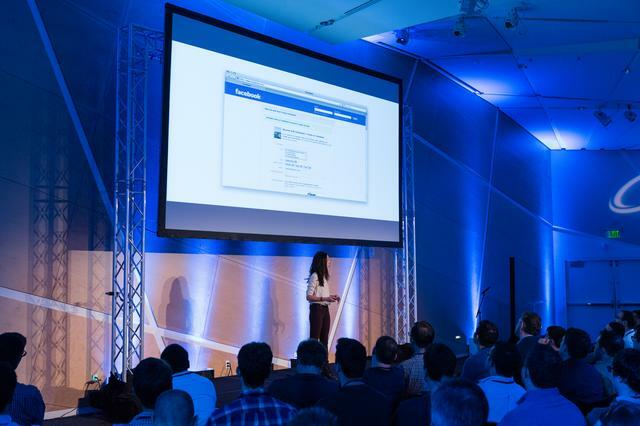 In this exclusive interview, Zhuo shares how Facebook finds, interviews and secures phenomenal designers — including those elusive Swiss army knife individuals who can do it all — and how startups of any size can apply these principles to build bullet-proof design arsenals of their own. According to Zhuo, finding the ideal designer who fits your needs is a two-part process. First, you have to find promising candidates (she runs through three concrete steps). And second, you need to decide if they're right for your team — which can be trickier than it seems. The best way to find great talent is to look at the products you admire and figure out who built them. “That’s how we hired some of our earliest designers,” Zhuo says. She recommends sourcing lists of beloved apps and products from your whole team — not just the ones that are commercially successful, but even small apps or ideas that have an angle of something great, selecting for the ones that showcase the same skills and interactions you’re looking to build. “Read the small print on products with elements you like— like a particularly effective UX, or an innovative feature, or a very polished, well-done navigation system, and then hunt through Google, LinkedIn and AngelList until you find the people behind them.” After you do that, the key is to not be too shy to reach out. People love hearing from fans, no matter what kind of work they do. In some cases, especially if you’re at a startup, it’s not unlikely that you’ll contract design work with people you’ve found on networks like Dribbble or Behance. Once you’ve found someone you like working with, but who you can’t hire full-time, they can become your entree to a broader network of designers who are more likely to understand your design language and objectives. A good search requires time and interpersonal energy. This is especially true when you’re recruiting designers who make decisions based largely on passion projects and learning opportunities. Early in the hiring process, Facebook brings potential candidates on-site to present their work to members of the design team. Seeing the work in person is a top priority. It's impossible to talk about design without looking at the work. For this reason, empahsis is placed much more on candidates' backgrounds than on in-person tests, brain teasers or white-boarding. “We don’t try to make these presentations too formal, like they’re giving a talk in front of a ton of people — it’s more like hey, we would love to learn more about your background and how you got to where you are now, and what excites you about the project you’re telling us about. What were you especially proud of?” Zhuo says. She has seen people put together elaborate Keynote presentations. But she’s also had people come in with just a folder of their past work and talk through it. Julie Zhuo presenting at CTO Summit in 2013. While Facebook does hire out of prestigious universities and top-ranked design programs, Zhuo emphasizes that this is just one aspect of their search rubric. It’s critical to remember that for every talented designer who graduates from a formal program, there’s another of equal caliber who learned independently. Product and design managers looking to weed out blander, less creative candidates with great pedigrees should look for indicators of proactive behavior in their portfolios. You want a designer who has looked for opportunities in their own lives: Problems that need fixing. Things that could be easier. Poor team dynamics are a problem for a company of any size, but they can make or break a startup fast. A superstar designer may not be worth the potentially fatal trouble of a superstar ego. And a shy but talented designer may not share their opinion often enough or have the initiative to do what needs to be done without being told. Ultimately, “You want people who are open to feedback but can also distill that feedback, have an opinion about the right direction to go, including what the pros and cons of different proposals are, and who can articulate all that in a way that everyone can understand,” Zhuo says. The best way to pinpoint this personality is to simulate the experience of being on the team in the interview process — and then assessing how the candidate fares. Zhuo and her team ask potential designers to walk through both their work and their story in an open-ended conversation to figure out what it would be like to work with them on a daily basis. Personality cues are just as important as their professional track record during this part of the process. When the candidate doesn’t know where the conversation is going, it’s harder to provide rehearsed answers, and it’s easier to slip into their true, everyday habits and beliefs. Not only does this help Zhuo and her team assess culture fit, it clarifies how the person will manage and deal with problems — including the unexpected. You can learn a lot about designers just from their process, how they got started, what they struggled with. When it comes to working on a team, “It’s not just about the final product,” says Zhuo. “It’s also about the process of getting there,” and hearing candidates talk about how they’ve moved through projects with past teams can shed immense light on their potential — and you can get a sense of their work ethic and ego along the way. A designer must have the capacity for high-level analysis. The right candidate should “have really great observation skills and pay attention… she really thinks critically about what could be better about any given product you throw at her," Zhuo says. Generally, you don’t want candidates that jump immediately into answer-mode. You want the candidate who asks about and appreciates the constraints, who suggests unique touches based on human behaviors they’ve observed, and who gives well-reasoned arguments about all their decisions. You want someone who asks a lot of questions, listens carefully, and weighs conflicting responses to arrive at an answer. Give your candidate the chance to assess what your team has done so far — and to articulate what they’d keep, what they’d change, and why. The mark of a really great designer is that every decision they've made has a purpose, has intentionality. The last question is a good one in particular, because it exposes a candidate’s values — and that should be the ultimate goal of your process going in, Zhuo says. When you ask someone to evaluate their work or someone else’s they are bound to focus on something in particular — the elegance of its look and feel, whether the core idea was a good one begin with, or the way different interactions play out. “We have multiple people ask similar questions like these because you want to understand what’s really important to someone. That's the key." Julie Zhuo started as a Product Designer at Facebook in 2006 after graduating from Stanford. Today, she manages the design and research teams working on News Feed, content, navigation and the core mobile experience. She tweets at @joulee.